Syrian mesquite (Prosopis farcta (Banks & Sol.) J. F. Macbr) is a woody perennial dwarf legume shrub, usually 0.4-1m high. However, in some situations, for example where weed control is absent, it can grow to 2-3 m, as tall as grape and citrus trees (Qasem, 2007). Its well-developed root system and rhizomes can extend to a depth of 15-20 m into the soil. Its stems are erect and its slender branches have short prickles, similar to rose bushes. Leaves are bipinnately compound, with a 1.8-3.0 cm long rachis and 9-13 pairs of small leaflets. Small yellow flowers appear from May to August. On each raceme there are 1 or 2 oblong pods, which are dark brown when ripe. The mesocarp is pulpy (eFloras, 2010; Qasem, 2007; Pasiecznik et al., 2004). Prosopis farcta is a minor fodder in Asia and in the Middle-East, and essentially an invasive weed that is very hard to control (Pasiecznik et al., 2004). Prosopis farcta is a Prosopis species native to Asia. Distributed from India to Iran, it has spread to the Middle East, and occurs in Cyprus, Turkey, Ukraine and along the North African coast as far as Algeria (Pasiecznik et al., 2004). It has a broad climatic range (Pasiecznik et al., 2004) and its seeds and seedlings appear to tolerate a wide array of temperature and moisture conditions. It is dominant under irrigation. In the central Jordan Valley, Prosopis farcta forms dense impenetrable thickets in cultivated fields. It is found growing along irrigation channels and water courses, waste places, roadsides, orchards and vegetable fields. It tolerates saline conditions (Qasem, 2007). 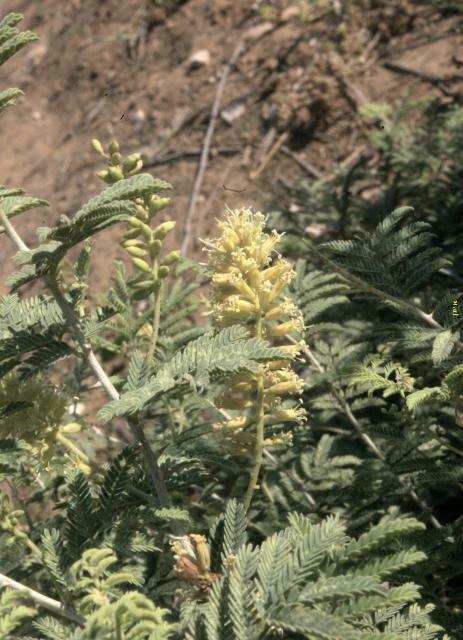 Prosopis farcta is among the most prevalent weeds in sesame fields in Turkey and in range land in the USA. It affects a large area in the Jordan Valley. An additional probem is that Prosopis farcta is the primary host of different plant parasites (dodder) and insect parasites (for example the white fly Bemisia tabaci, vector of the tomato yellow leaf curl virus). A drought-resistant species, Prosopis farcta regenerates from seeds and basal buds on the rhizomes located at or just below the soil surface. It resumes growth after a very short dormancy period in the winter and spring, and re-vegetates during the summer through the autumn (Qasem, 2007). It is generally difficult to eradicate. Weeds can penetrate plastic covers. Rhizomes and seeds are unaffected by soil solarization treatments. Burning and hoeing are ineffective as these methods leave the parts below ground, and hoeing may break the rhizomes into viable fragments, thus further increasing encroachment. Attempts to remove the weed from cultivated land are usually unsuccessful because the weed soon resumes vegetative growth and then spread rapidly. Grazing may be partially effective in reducing its vegetative mass but only at early growth stages when the thorns and branches are still soft, because after that the weed may only be grazed by camels. Control from grazing pressure alone may at best decrease the rate of invasion and will not entirely prevent weed invasion (Qasem, 2007). In Iraq, profitable barley cultivation was found to depend on the existence of Prosopis farcta in the fields. This species counteracts salinity and maintains porosity of the soil by deep rooting. Tolerance to drought and salinity is advantageous for soil improvement and to control erosion. It is also liked by bees, and is a useful fodder for cattle and sheep in desert areas (Hanelt et al., 2001). 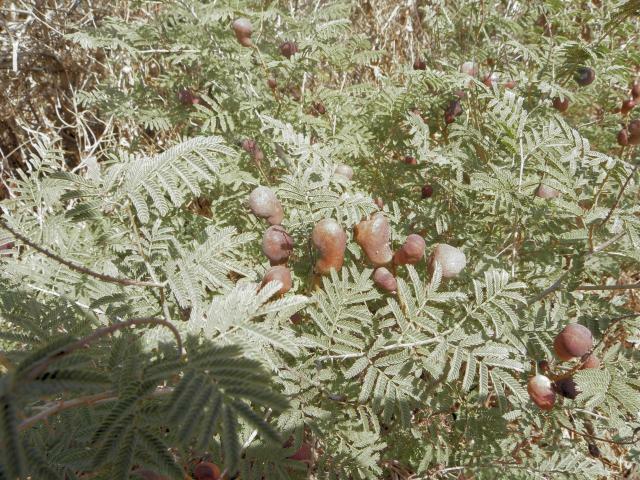 There is little information available about the nutritional value of Prosopis farcta. An analysis from 1920 reported that the pod DM contained 14.5% protein and 15.7% crude fibre. The seed DM contained 20.1% protein and 9.3% fibre (Anon., 1920). Seeds were also found to contain sugars (notably sucrose) and mucilage (19.3% DM) (Shalaby et al., 1976a). The pericarp was rich in tannin (18.6% gallotannin) (Shalaby et al., 1976b). Prosopis farcta is useful as browse and provides fresh fodder throughout the dry season (Göhl, 1982). Young parts are browsed by camels, goats and sheep (eFloras, 2010). In Upper Mesopotamia (Iraq), Prosopis farcta provides low quality forage to camels (Zakirov et al., 1989).